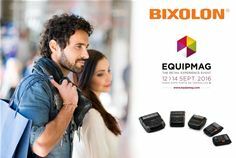 Equipmag (12-14 September 2016, Paris, France) – BIXOLON (stand 3H 111), the global manufacturer of advanced Receipt, Label and Mobile Printers will be encouraging visitor’s to discover BIXOLON’s leading range of retail printing solutions at Equipmag 2016. Delivering innovative mPOS retail printing solutions, BIXOLON will be showcasing its B-gate mPOS hub solution which provides the previously missing link between smart devices and wired POS peripherals. Eliminating the need for expensive POS systems setups, B-gate easily connects standard peripherals with tablets or smart devices via its intelligent Bluetooth or Wi-Fi interface. Demonstrating the world’s first POS printer with a five year limited warranty at the show. The SRP-380, 3” (80mm) super-fast, powerful, low-maintenance, direct thermal POS printer sets new standards in reliability and printer life expectancy. Enhancing business continuity with new functionality, the SRP-380 offers intelligent software & firmware settings for paper saving functionality. BIXOLON will also be exhibiting further revolutionary Mobile, Label and POS printing technologies such as the sleek & lightweight, SPP-R200III and SPP-R310 next generation mobile printers with NFC auto-pairing. The water resistant, front exit SRP-F310II, the updated SRP-275III with Ethernet on-board connectivity, the improved SRP-330II, complete with triple interface and the new SRP-S300 re-stick, liner-free label and receipt printer. Alongside the all new SLP-DL410 fan fold label printer, SLP-TX220 two inch Thermal Transfer label printer and SLP-DX220B label printer with integrated Bluetooth.